Don’t let the Council turn you into a CASH COW! Receiving a Parking Ticket in London is part of the routine of someone driving in the streets of London, especially because many of London’s council administration are trying to cover the government’s cuts with money generated with parking fines. For us, Man with a Van working in London, we are the main victims of this scam. Therefore, due to the amount of fines we’re receiving in 2011, we developed at 7 Steps to avoid parking Fines. Therefore, next time you get a Parking Ticket don’t panic, go through the 7 Steps and you will a have a fair chance avoid it. 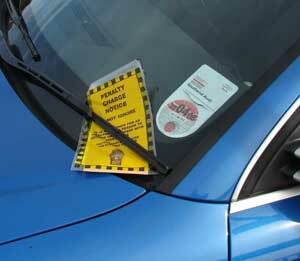 When you get a parking ticket don’t just pay it straightaway, many tickets are issued incorrectly. Therefore, give it a good look; check that your vehicle’s details are exactly correct (number plate, model and etc). Ensure that the traffic has fined for the right reason, sometimes they could enter the wrong information and this would invalidate the ticket. For Single Yellow Line: sighs posts must be within 60 metres from each other. Pay & Display: It must be NO MORE than 30 metres from parking bay. NOTE: If you driving a goods vehicle, Such as van or lorry, you are legally aloud 20 minutes on a Single Yellow or resident permit , unless sighs say otherwise. Ensure to take photos if you find anything that is inadequate, that could get your ticket cancelled. For motorcycles, parking is also very restricted in central London. Note that if you use a rain cover, traffic wardens are not allowed to interfere with the vehicle, so if they can’t see the number plate of tax disc, NO FINE. If you see a traffic warden near to your vehicle, get into the car and drive away, if he didn’t take photos of your vehicle yet, they will have to cancel the fine for lack of evidence. There are precedents in court of people winning against council because the traffic warden didn’t place the fine in his vehicle. Don’t try to hush getting away from a fine and risk a car accident, specially be very careful not to run over the traffic warden, which could have very serious implications. Remember, safety above all. Now, if you fined by one of these Cowboys that supervise private property such as supermarkets, hospitals, housing state and retail car parks; It is important to KNOW that this Cowboys are unregulated, therefore can charge as much as they want unfortunately, HOWEVER, only tickets issued by authorised wardens and the police are legally valid, THEREFORE, a ticket from such a firm is NOT A FINE, and simply a notice of breach of contract, and they have no power to force you to pay unless they go to the hassle and expense of taking you to court and winning. If suffer from Dyslexia, the sign could be using a font type that discriminated against dyslexic people, therefore, making you likely to misread the sign. NOTE: Dyslexic people have difficulty reading some fonts printed on white background. If could not avoid paying your ticket by any of the previous steps, be generous, send a cheque payment with a value a little higher than the value of the fine, such as a £1 pound more. This creates so much hassle and paperwork that overworked council administrators could throw the whole thing into the bin. "We can highly recommend this company. All their operatives are prompt and polite and perform anything asked of them with a good spirit and high level of professionalism. Highly recommended." "A very punctual, friendly and efficient service from the management to the individuals carrying out the move. "Very friendly and efficient service."